I don’t reaaaallly have to tell you how bad fast food is, do I? Well, I will anyway….. it’s loaded with fat, sugar, salt and artificial stuff galore. It’s not the kind of food you want your family to be eating on a regular basis. I know, I know…… there are days when cooking a meal just seems the last straw after a huge, messy day. But trust me, your body will thank you for it… no fast food hangover the next day. Your wallet will be happy too. So, I have got some REALLY easy, I mean RIDICULOUSLY easy ideas to save you from the fast food trap. I am not reinventing the wheel here… some of them are nothing new. There are plenty of things lurking in the pantry that can give your families a nourishing meal with minimum effort expended. 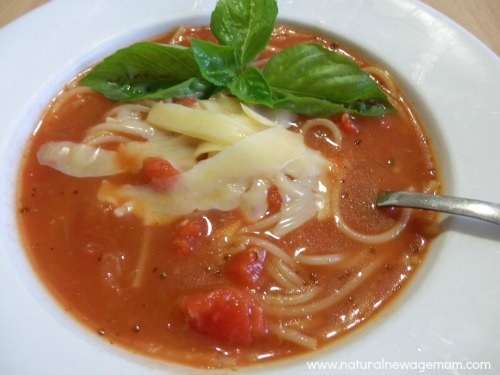 TOMATO NOODLE SOUP : Try this super quick Tomato Noodle Soup using pantry staples! TUNA COUSCOUS: Grab a can of tuna (in springwater and dolphin friendly) and some couscous (organic wholewheat or corn for the GF people) from the pantry. Raid the fridge for salad ingredients – onion/shallots, tomato, capsicum, cucumber, carrot, etc. Pour couscous into a stainless steel or glass bowl. Boil kettle and pour just enough water over the couscous to cover, maybe a tiny bit over. Cover with teatowel. Meanwhile, quickly chop up some salad into small dice. Add veges to couscous and then mix in a tin of tuna and a good grind of salt and pepper. Any fresh herbs you may have can be added too or use a sprinkle of dried. Serve. Eat. VEGE PASTA : Grab from the pantry a bag of organic wholemeal pasta (or GF pasta) and a jar of organic pasta sauce (Jensens make a nice one). Cook pasta while you sit down for ten minutes (boil water in the kettle and put into the saucepan for even quicker set up). Dump in the jar of sauce, stir around. Add whatever leftover veges or meat happen to be floating around in the fridge or a can of tuna from the pantry. Heat. Serve with some fresh parmesan cheese on top (not the packet stuff please). Serve. Eat. BEANS N TOAST : Grab a can of organic baked beans and a couple of slices of good quality bread. Chuck beans in saucepan and heat. Make toast. Add beans to toast and sprinkle with grated cheese. Serve. Eat. FRIDGE PICNIC: Assemble artistically on a platter any of the following : leftover cooked meat, hard boiled eggs, cheese, fruit, salad veges, additive free crackers, chutney or pickles, dried fruit, nuts. Serve. Eat with fingers. One plate to wash up. BONUS! POACHED EGG on TOAST: Get a large frypan, fill half with boiling water from the kettle, drop in some egg rings, drop your organic eggs into the egg rings and put the lid on. Take them out when they are just done to your liking. Spread slices of good quality bread with organic avocado and top with egg. Add a good grind of salt and pepper. If you have any tomato and spinach to hand, heat and eat that too. You are on your way home from work and the fast food joint is calling your name….. set your GPS and detour immediately to the nearest supermarket! *Grab some organic meat and a bag or box of pre-cut salad and a punnet of cherry tomatoes. When you get home, grill the meat, chuck the salad and tomatoes in a bowl. Throw away any dressing that has come with the salad. While the meat is grilling, add some olive oil and vinegar, mustard, garlic and seasonings to a jar and shake. Pour over salad. Eat. *Grab a packet of noodles (choose additive free ones), a packet of pre-cut stirfry strips of any meat you like and a bag of pre-cut stirfry vegetables. Go home, chuck it all in the wok with some coconut oil, grate in some garlic and ginger. Splash in some soy sauce or tamari. Eat. Also known in our house as freezer-free-for-all ! Build up a stash of frozen meals. Whenever you cook, make extra. Curries, spaghetti bolognaise, lasagne, mince patties, whatever. Some frozen, organic Australian vegetables (no sauces etc) are also handy to get some veges on the side. Name and date the containers and you will always have a nutritious meal on hand to save you from fast food! So, there you have it, a few ideas to get you started. I would love you add your own ideas in the comment section ! I will be printing this off twice…One for me and one for my time deprived, hard working daughter. All great suggestions Sonia. We are on the same wavelength tonight I think. Eggs!! i chop up an onion chcuk in a small pan to stir around on low heat with some oil – then beat 2 eggs, throw in chopped tomato with whatever you have maybe some herbs, some cheese capsicum – whatever floats your boat and doesnt sink it… keep heat low add in that egg mix to the pan – cook about, 2 – 3 mins? stir it here and there as you go if you want it to be more scrambly and less omelettey and towards the end add in some spinach. serve on some toast or in a wrap. YOu have made dinner faster than you can even order the pizza!! Love it. Eggs are the best! I know this is an old post, but I just found your blog and have been trawling through it! A favourite take away style meal in our house is home made pizza. We use good quality wholemeal pita bread as bases and top them with heaps of veggies and cheese. Another good one is sushi, and it’s fun for the whole family to help make. And the kids love hot pasta with some grated cheese and chopped tomato mixed though. The cheese melts into the pasta and the kids love it. We very, very rarely ever do takeaway. It’s usually a GF pizza home delivered if I’m really sick with something!